This blog post is a little bit overdue. I've been wanting to share my experiences with online learning for a while now. I just never got around to sitting down and writing about it. So here it goes. Here's my experience with online learning with the University of Guelph along with a few tips and tricks I've learnt along the way. 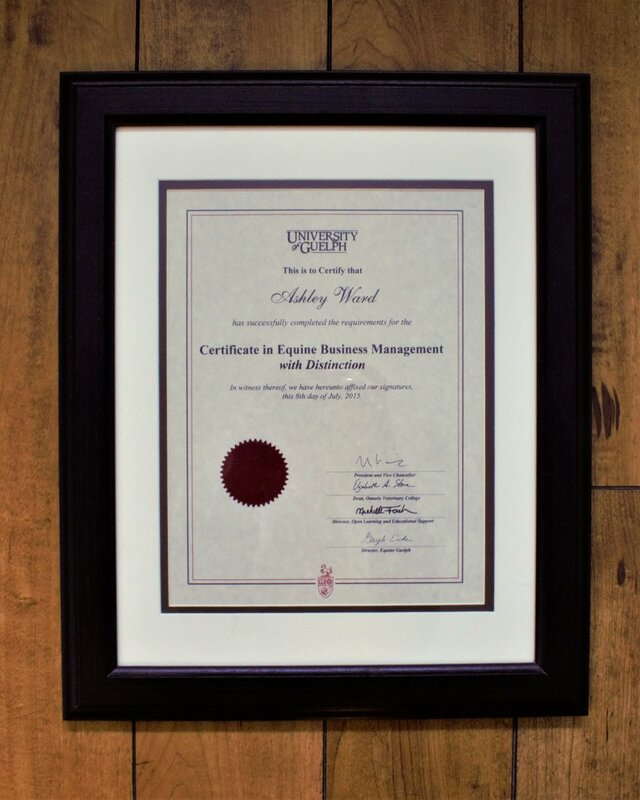 I enrolled in two programs; the Certificate of Equine Business Management and the Diploma of Equine Science. Both are completely online. There's no scheduled class times or Skype chats. You get to work at your own pace just as long as you submit your assignments by the deadline. Making it very easy to learn and work at the same time. Why did I choose to study online? This is probably the most common question I get when people ask me where I went to school. For me, there were two answers to this question. The first, it's much cheaper than studying on campus. This might not be true for all online courses, but it was for mine. It meant that I could stay at home, save money and study while working. It ticked all the right boxes for me. The second reason was because I didn't have the money to take the chance and study something I might drop out of. Like many high school seniors, I didn't know exactly what I wanted to study. At first, I wanted to study journalism, then it was chemistry and then it was nanotechnology. I was never certain. So, the plan was to take a few courses online on a topic I loved (horses! ), save up and take the time to figure out what I truly wanted to major in. Through these courses, I found my love for business and marketing. Something I never thought I'd be interested in. Something I definitely never would have known if I didn't enroll in these programs. The pros to learning online are pretty obvious: study from home, save money and work on the side. You have more access to schools you could never attend in person. Schools all over the world that are more credited than the local ones around you. As great as online learning sounds, it does still have its disadvantages. The first one being the lack of interaction. Again, this will vary from course to course. For me, because there weren't any set class times or Skype calls, I never actually saw any of my classmates or my teachers. Sure, we had forum boards where we would discuss different topics each week, but there was never that face to face, real time discussion. That interaction was really lacking in my mind. Another thing that might be obvious is that you have to be self disciplined in order to learn online. You don't have your peers around you to make sure that you study. It's just you, your computer and your textbooks. It's very easy to turn on the tv or open another tab and surf the web. Even if you try to convince yourself that you're just taking a break, it's very easy to procrastinate. I'll be honest, it's not easy. You will learn to manage your time and discipline yourself, but it's something you need to be conscious of. Do you have any advice for someone looking to study online? Go for it! Give it a try. You never know, you might really enjoy learning online instead of commuting to a campus. Make sure you stay focused though. If you have to, download a procrastinating app for your computer and phone so that it doesn't allow you to jump on social media or browse the web when you should be studying. Make sure to do your research too. Not all online classes are created equal. Not all of them will give you a degree or be recognised as a post secondary course. For example, the courses I took through the University of Guelph are considered continuing education courses. This means that they're designed to help your grow in a subject while also working at your job. Hence why it's not a bachelor's degree or full-time education. So depending on what you want to get out of your online learning, make sure you take a course that will fit in with that goal. But most of all, work hard and learn a lot. Enjoy the special experience online learning offers. If you have any questions or comments, write them below and I'll reply as soon as I can.